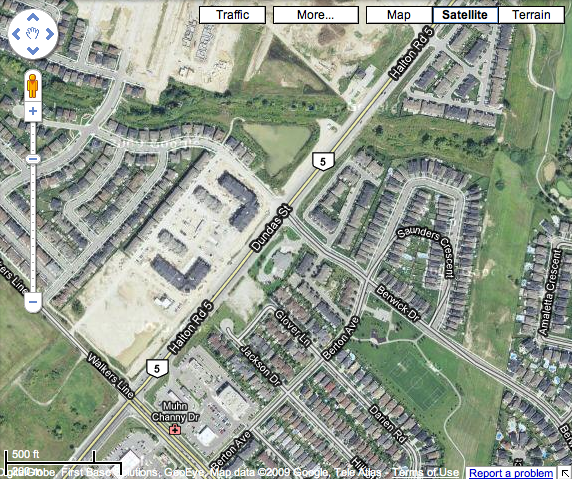 Looks like Google recently updated their satellite images of the GTA. Our house is finally recorded in satellite images, and the FantAcura. The street maps aren’t updated yet, but that will come. If you’re looking for a free-for-reuse and more updated map I’d recommend OpenStreetMap.org. Update, Bing Maps just came out of beta — and they’re maps are even more out of date! Lindz and I bought a Christmas tree on Sunday and put it up in our cheap plastic tree stand that day. This is the first year we’ve put the tree up on our main floor with 9′ ceilings, so we went with a 8′ tree. Monday night we decorated it and went to bed. At about quarter to four in the morning we were woken by the crash of a tree and christmas bulbs rolling across our hardwood. Lindz and I both got up with a start and as Lindz turned on the lights while I charged for the tree and started lifting as soon as had a hand on it and place it in the corner of the room. I know from an incident with a cat, a fish and fishbowl in my parent’s kitchen what large amounts of water can do to hard wood. The good news was that our area rug absorbed all the water and didn’t let it through to the wood. We propped the rug up on a chair and placed a fan in front of it. Lindz place the tree skirt in the tub and at about 4:15 we went back to bed. Lindz got some sleep, but I didn’t. For those of you who are wondering what a drobo looks like when it’s rebuilding itself. The drobo allows you to make Moore’s law work for you. The 1 TeraByte drive being replaced cost $20 less than the dead drive being replaced. If your curious the original drive was a Seagate/Barracuda, the new one is Wester Digital Caviar Green. You are currently browsing the iMatt :: The Blog of Matt Clare weblog archives for December, 2009 .